The new FINA Approved NeroFit jammers from Blueseventy are designed for performance and racing. These fully bonded suits use Blueseventy Nero technology, with lightweight comfort fit fabric. The bonded construction of neroFit enhances hip lift; promoting better body position and streamlining. The NeroFit Jammers combine elite competition technology with comfort and flexibility, making them an ideal choice for junior and master swimmers who want performance without spending 20 minutes getting their suits on. The new FINA Approved NeroFit jammers from Blueseventy are designed for performance and racing. 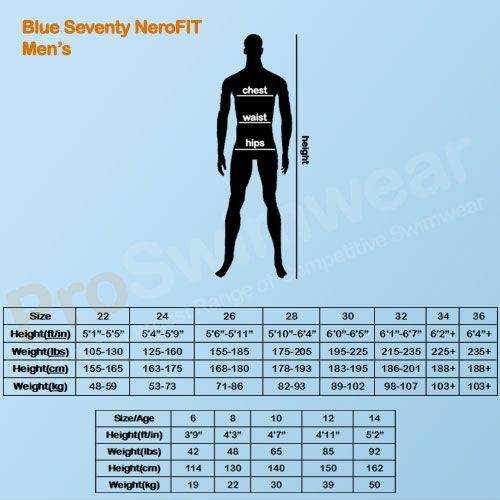 These fully bonded suits use Blueseventy nero technology, with lightweight comfort fit fabric. The bonded construction of neroFit enhances hip lift; promoting better body position and streamlining. If your child is well under or over average size then you’ll need to size up or down, but the vast majority of junior swimmers will be able to wear the size based on their age. Please note: Experienced competitive swimmers who want tight fitting suits should size down.